When a beautiful Indian woman hands Jack his own business card, which she claims he gave her aunt forty years ago, there is no doubt in Jack’s mind that another quest is about to unfold. Before the riddle is unraveled, Jack is off to New Delhi, Bombay and Bangalore. In an abandoned palace, he discovers a presence that speaks to him with his own voice. 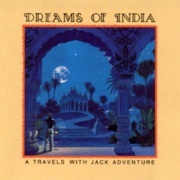 Chanting monks, temple bells and authentic Tibetan horns transport you on a metaphysical mystery through exotic India. * Received the Audiophile Golden Earphone Award for a “truly exceptional audio presentation”. 2 Audio CDs, 2 hrs.